Mizuno Iron Golf Club Fitting Cart. At John Dooley PGA, we have the full Mizuno iron golf club fitting cart available for golfers that are looking for one of the best golf club brands on the market. Mizuno golf is known for manufacturing and providing an expert players range of golf clubs. Notably, Mizuno golf sponsored great players like Nick Faldo and Sandy Lyle. Whereas, today’s players such as Chris Wood and Luke Donald also play Mizuno. 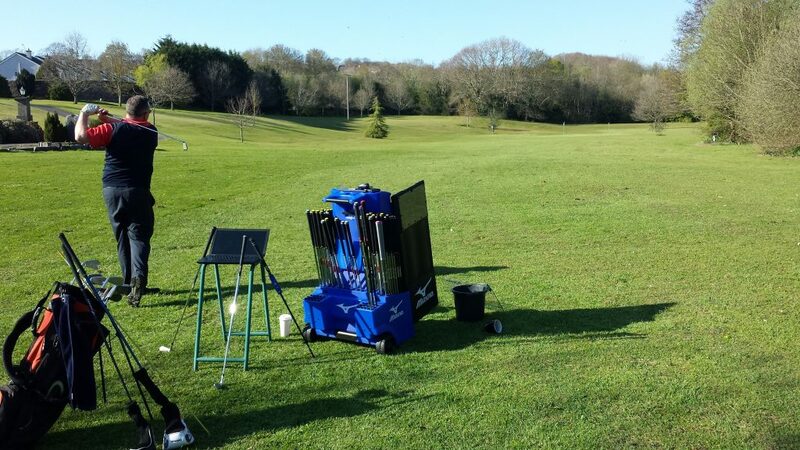 Mizuno Club fitting sessions are available from Monday to Sunday during daylight hours. Each club fitting session should take approximately one hour to fully identify. The correct shaft to suit your swing speed, the club-head type that is best for your golf shot. Then we are looking at the lie angles of the club head to keep the ball flight straight. Additionally, Trackman is used to measure the performance of your older clubs to the newer Mizuno clubs. It’s pretty cool to see the differences between what you might have thought was the right club for you and what technology is suggesting. You can book a Mizuno Iron club fitting time by contacting us at john@johndooleypga.ie or call 0879277997 to book a time and date that suits you. Plus you can buy the whole range of Mizuno golf clubs directly from John Dooley PGA.